Green Bay Elite is attending the event for the 5th year in a row and they are hoping to continue their tradition of success at The U.S. Finals. The program has earned five titles in the past and they brought five more teams to Chicago this weekend to try and add to their trophy case. Green Bay Elite is known for delivering fun and energetic routines to the mat that have a strong focus on technique and cleanliness. “We feel our teams strength is stunting!” GBE Owner Cherokee Greendeer told Varsity TV. “It has always been our strong point and we love doing it!" Greendeer knows a thing or two about creating top-notch teams. She was named USASF coach of the year and was also nominated for gym owner of the year! 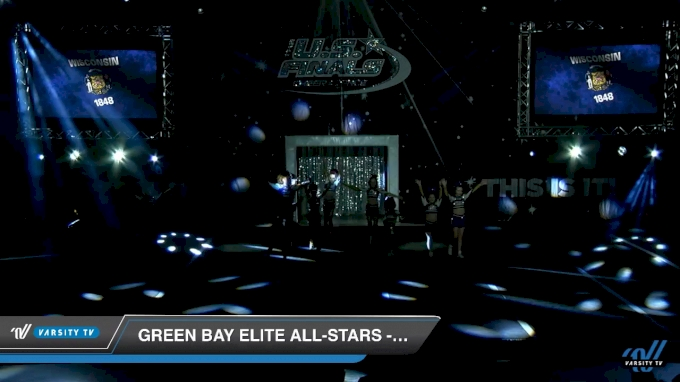 Green Bay Elite teams performed on Day 1 and their routines were a must watch. Their Youth Level 1 team, Violet stood out for their energy and strong tumbling skills. While Violet might be one of the youngest teams GBE brought to the championship, the gym rallies around each of their athletes and enjoys cheering them on throughout their performances. “Our Violet team has a small little part where the whole gym yells VIOLET in their music and it is so fun to help our gym come together to cheer for our kids!” Greendeer added. Will Green Bay Elite add to their championship success this weekend? Tune in to Varsity TV to watch the Wisconsin team compete LIVE at The U.S. Finals Chicago!